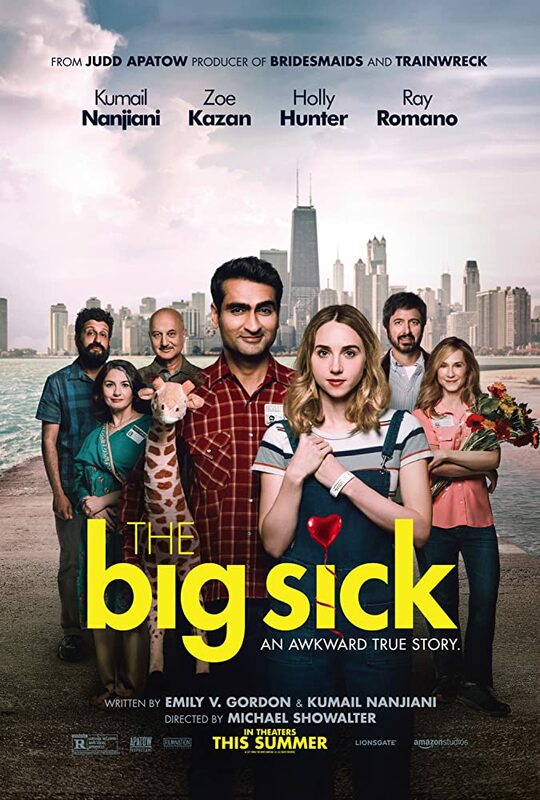 Based on the real-life courtship between Kumail Nanjiani and Emily V. Gordon, The Big Sick tells the story of Pakistan-born aspiring comedian Kumail (Nanjiani), who connects with grad student Emily (Kazan) after one of his stand-up sets. However, what they thought would be just a one-night stand blossoms into the real thing, which complicates the life that is expected of Kumail by his traditional Muslim parents. When Emily is beset with a mystery illness, it forces Kumail to navigate the medical crisis with her parents, Beth and Terry (Holly Hunter and Ray Romano) who he’s never met, while dealing with the emotional tug-of-war between his family and his heart. The Big Sick is directed by Michael Showalter and produced by Judd Apatow and Barry Mendel. After earning rave reviews at its Sundance premiere, the dramedy developed big buzz prior to its theatrical release and has already almost made back its total budget thanks to a stellar opening week. Written by Nanjiani and Gordon, the film tells the story about their relationship pre-marriage and how one terrifying scenario helped to rekindle their love for one another. Out of Sundance we often see these family based dramedies where someone becomes an outcast due to the life decisions they’re making. These films often feature the usual quirky family and friends played by familiar actors and a protagonist that faces a dilemma where they have to choose between family and opportunity. Yes, The Big Sick is similar to those other movies but what elevates the film to another level is the honesty in which the story is told. Watching a portrayal of a culture we don’t see often on the screen was refreshing as the lead character must decide between sticking to his Pakistan heritage where arranged marriage is a tradition or follow his heart and pursue the girl of his dreams. Throughout the film we feel an array of emotions and none of them ever feel forced or unnecessary. Comedy always lands with roars of laughter while the drama always hits a nerve. Heartfelt, humorous, poignant, and an intelligent story overall. This serves as the breakout role for Nanjiani who writes and stars here. Though he is playing a form of himself, Nanjiani manages to provide the viewer with quick-witted one liners and nuanced drama when provoked. Having seen him only as a comedic presence previously, here he proves there are layers to his talent as his heartbreaking scenes will leave moviegoers misty eyed. What makes Nanjiani such an appealing character is that he’s just an overall likeable guy, even the mistakes he made with Emily have a reason behind them. The chemistry between him and Kazan is impeccable as they riff off one another from the first scene. Kazan plays Emily, the adorable girl next door who catches the attention of Kumail during one of his stand-up gigs. She complements him well with how she is able to take a joke and dish it right back. Ray Romano does great work as the uptight, dorky father of Emily who comes to the aid of his daughter when her health takes a nosedive. The relationship he strikes up with his daughters ex boyfriend is charming as they begin to build a bond with one another. Soon Terry begins to open up and reveal the regrets he lives with. The two are polar opposite but they bring out the best in each other as they both turn a new leaf. Holly Hunter plays the anxious mother who despises Kumail initially but eventually warmups to him when she sees how committed he is to the current situation. Seeing the respect slowly grow between Kumail and Emily’s parents throughout the film is rewarding as the three of them have some incredibly funny and poignant moments between each other. Often the case with many Apatow productions, The Big Sick could have trimmed down its two hour runtime by 10 or so minutes. There are times when certain scenes are overlong and supporting characters have more screen time than necessary. Regardless of those minor critiques, The Big Sick features a cast of incredible talents and boasts an emotional rollercoaster of a script. The involvement of both families help to show the opposites sides of the parent spectrum. Having a dramedy where the lead has a culture clash with his heritage was an invigorating experience. The film packs a punch with its comedy and delivers bitter sweet drama in its finest form. As The Big Sick continues to expand its theatrical run do yourself a favor and hunt this one down. The Big Sick is available in select cities now before it opens across Canada July 14, 2017.